Oh I love the warm weather. There is something about this warm time of year that just makes me happy! I love to spend my days outside working in the yard, playing with the kids, and grilling outdoors. The last thing I want to do is spend my day cooped up in the kitchen. This great side dish takes very little time to prepare and uses up all of those great garden/farmers market veggies! Did I mention it is fresh, tasty, and goes with everything!? 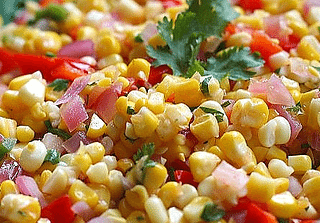 Add this great Summer Corn Salad to your next BBQ meal! Substitute: Make this your own by switching out the veggies, or adding your own seasonings to the dressing. Grill: You can wrap the corn in aluminum foil and cook it right on the grill to stay out of the kitchen! Find more great sidedishes here! I cannot wait to try this! It sounds so so yummy! I shared it in my FB page…awesome recipe! I know it sounds crazy but corn is actually delicious in a salad (off the cob) UNCOOKED. I thought it was a little nutso until I tried it and now I’m totally hooked 🙂 Its preserves more of the nutrients that way too. This sounds really good. I make a similar corn salad but the dressing is a little different. I will give this one a try next time. Thanks for sharing it. I found you through Totally Target. I look forward to checking out more of your site. I love this recipe. When you use Cilantro, a great addition is to squeeze fresh lime juice as well (maybe instead of vinegar) to give it a very Mexican taste. I made this today, to bring to our neighbors’ house for their Memorial Day picnic. I used basil (we know so many who dislike cilantro — though we love it — and good thing, as the neighbors commented as to how much they dislike cilantro). I did not measure anything, but I surely used more vinegar than the recipe states, as I kept adding it while making it. I’d guess I used about 1/4 cup — and I used aged white wine vinegar (more flavorful than generic white vinegar). I probably used a bit more oil than stated here, but not much — again, no measursing, just a gradual add/taste/add more. For the onion, I used Bermuda & Vidalia since I had both and like the flavors of each of them. Everyone loved this salad, and the hubby thinks he’d like it as a sort of relish on a hot dog.